The Handicap Run is a 5K and takes place on the 3rd Wednesday of every month . The first time a member does the run gives them a qualifying time which is used as their handicap. The handicap time for each runner is the average of their last three runs (except for new runners). Runners set off according to their handicap time with the slowest first. This means that all runners have an equal opportunity of finishing first. Each runner scores points based on their finish position - the higher you finish the lower your score. The lowest 6 scores of each runner over a year (Jan to Dec) are added to find the over-all winner of the Handicap Trophy. The first person over the line each month is given the monthly trophy but returns it for the start of the next month's run. All runners are registered at start at 6:45. The run will start at about 6:50 and be finished by about 7:30. The run needs 3 people to do the organising. 1. Starter/Timekeeper 2. Finish position recorder 3. Assistant position recorder. All three organisers look after the runners clothes which need carrying from the start to the finish. Please volunteer your help at some point during the year. (April-Sept) Cotleigh Village Hall. Park in hall car park. The route is one loop of quiet lanes. 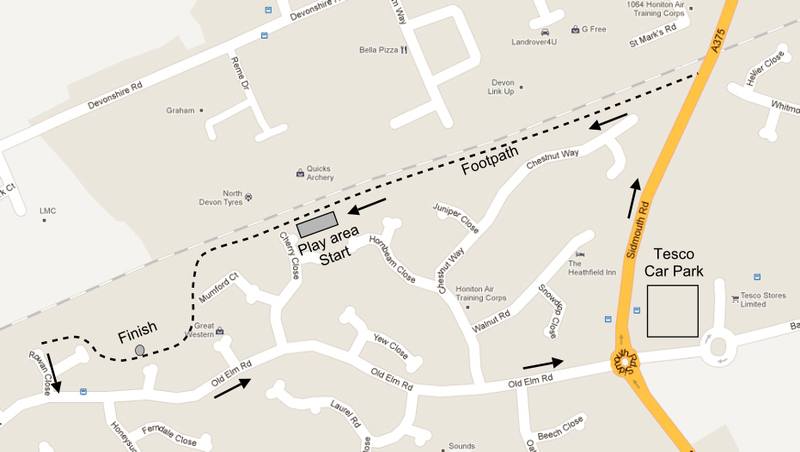 (Oct-Mar) By play area Cherry Close just off Old Elm Rd (see map below) Members of the club generally park at a convenient point along Old Elm Road but this can get congested so then it is better to park in one of the side roads, without blocking entrances to driveways. Alternatively park at Tesco's Carpark and then walk down to the start (about 400m.) It is a 3 lap course shown below. The route is only a mile in length so the finish is about 150m from the start to make it 5K.